Put a Fork in The Baby's Head with Shockwave. 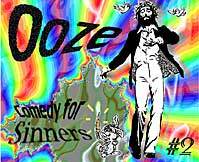 In Ooze #10, we took on Sci-Fi geeks AND Christian Fundamen- talists with this parody site - The Force is a Tool of Satan. Also check out our analysis of the whole debacle in Ooze #10. Lady Di's untimely death touched us very deeply and made us write a song. Access ftp.ooze.com via your browser or FTP program to get the latest ooze files. The Mac files are encoded in binhex format. This means, that when you download them, they will usually show up on your monitor as a bunch of weird looking text. Save this as a text file with the extension .hqx on the end. Then you will need to get a hold of a program that will translate binhex files into regular binary ones. Bin Hex 4.0 is good, so is Stuffit. After you translate these files into binaries, you will also have to unstuff them with something that can read .sit files. Netscape will do all this for you automatically. Complicated? Sure. But possible. And the Mac and PDF versions is a great thing to trade to your non-internet using friends in exchange for illegal commercial software. Read the press release from the first time. UPDATE: Ooze central has been replaced, and is still being paid off on credit cards. Ooze is now insured for $5000... so please take it again. I can get a new G4. Ooze #1 - #3 are NOT web ready! (They were released in late '93 to '94!) They are funny, and need to be converted into HTML when I feel like it. E-mail me for inspiration. For now you can read it in text, PDF or Macintosh application ONLY! Learn how Tipper Gore would have put you in jail if she occupied the White House, the Secret History of Ooze, rejected Scholastic Books Posters, walking in on a Guy taking a Crap, and the People Who Enjoy Eating Tasty Animals. Ooze #11 - THE FINGER: A COMPREHENSIVE GUIDE TO FLIPPING OFF! - You've seen it on TV, you've seen it on the streets! Now... see THE MIDDLE FINGER on Ooze! The online companion to our BOOK - available here at Ooze and in bookstores everywhere. Of course, if you're too cheap, you can get the gist of it from this issue. For bizarre legal and lazy reasons, there is no text nor mac edition for Ooze #11. 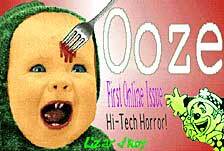 Ooze #10 is the Science Fiction Issue. Why Hot Chicks Don't Do Guys Who Like Sci-Fi, The Force is a Tool of Satan Explained, More Rejected Ben & Jerry's Flavors, and William Shatner Acts Silly. Of course, there is a buttload of other crap you will love. Use your tricorder to get the Mac Version. Ooze #9 is the "Internaccionale" issue featuring Ill-Informed Impressions of Other Countries, Foreign Ooze Subscribers Bite Back, Unlikely Cultural Exports, New Phone Pranks, Tours of Mexico, Hawaii and More! You'll never want to leave your house again! Ooze #8 is the Teen Issue banned in Norway. Teen World's Records, Teen Idols, Fashion Tips for the Poor, and more. All embarrassing questions are answered! Ooze #7 is the Post-Holiday Issue. It's never too late to be Xmas. Celebrate the holiday season with articles on Rejected Xmas Specials, a war-rattled Santa answering his mail, Phone Numbers You Should Call, Green Eggs & Hamlet and more more more. Spew on the Mac version. 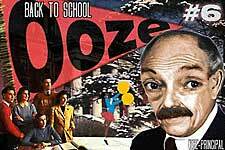 Ooze #6 is our Back-To-School Issue. Featuring articles on How to Tell if Your Kids are on Drugs, Selections from the unexpurgated edition of Newt's new book, Rejected Ben & Jerry's Flavors, Canceled Newsgroups, New Courses for Colleges, etc. etc. Ooze #5 is our Nerd Issue featuring an expose on Nerds who love Trek, "Cyberspace" and Role-Playing Games Conventions, also stuff on Girls (again), Living Skulls, Numbers for Everyday Living, Satan, New Band Names and of course, more. Ooze #4 covers Gods, girls, glass eyes and love. Big-Deeluxe 1 Year Anniversary Issue. My first foray into publishing on the web. It's primitive, but it works. Inhale the Mac version of Ooze #4. It smells funny, includes a quicktime slide show, and a screaming new extension for your system. Ooze #3 (not on the web) Includes Computer Games that Never Sold, Phrases You Should Know in every Language, What I Remember of The 80's, and so much much much more! Ooze #2 (not on the web) includes: How to Buy a Crappy Car, The End Times are Here, The Sad Story of My Colon, Ask Dr. Speckman: Advice to the Lovelorn, 40 ways YOU can help DESTROY the Earth, and a touching article submitted by one of our readers on the finer points of Stalking The Ones You Love... and many more surprises! Full of offensive articles! Ooze #1(not on the web) includes My Bar Mitzvah with Batman, Fads that never Caught on, Fun Kids Games, Your Stupid Life: A Manifesto and more!